In the 80s, the video game industry was booming. And then it fell, and fell hard and fast. Too many games flooded the market, prices dropped, profits disappeared, and companies failed. The industry basically died and was restarted a few years later by completely different companies. Could this happen again, but in a different industry? This week Disney announced that they will start a new streaming service and pull their content from Netflix. That’s fine if you don’t want Disney content. That’s also fine if you only want Disney content. Which, since it includes Star Wars, Pixar, ABC Television, and Marvel, is maybe just as likely. If you want it all, you’ll need both a Netflix and a Disney subscription. There are already many popular shows on other networks that have exclusive distribution. HBO, Amazon, Hulu, Starz, and many more all have shows that are exclusive to their own services, or at least could be in the future. CBS is soon to premier a new Star Trek series that is exclusive to their online CBS All Access service. If you want to cut the cord and not use a cable provider, you may also need to choose between an Internet streaming service like the ones offered by Dish, DirecTV or YouTube. In the near future, instead of a single cable TV bill, you may have to deal with a dozen streaming video services. Do you now see where I am worried about the same time of market fragmentation that the video game industry suffered with in the 80s? Once people start spending more than $100/month combined on these services, competition will be fierce. Investment money may come in to let some of these streaming services run at a loss so they can cut their prices down to a few dollars. After a while, they may all be losing money as they compete for market share. What will happen then? Will only a few survive? Will they buy each other out and we’ll just have two competing streaming giants (Netflix-Universal vs. Disney-HBO)? Where do you think the future of TV is headed? I was just saying the same thing to a friend in a discussion a day or two ago. The purpose of cutting the cord was (for me) to cut down the monthly cost and to avoid paying for things that I didn’t watch. But who wants to be paying 6 or 7 different companies’ bills each month, especially if they add up to more than what I was paying before? I’ll strive to keep it simple, all under one roof. Or perhaps find other things to do with my time. All this is quite possible. However, in Europe, and especially in the UK, we have a government-funded regulator and a market with the result that some element of competition is protected to prevent monolithic providers. We have this sort of balance in the electricity industry, for instance. I think something similar occurs in the banking world. So liberal democracy has both capitalist and socialist elements in its composition. I don’t see much similarity between the ’80s video game bubble and today’s TV industry. ’80s game companies such as Atari were immature (as were their customers), struggling against the limitations of the time’s crude computer technology. Today’s content producers, broadcasters and set manufacturers are huge, well-established conglomerates. 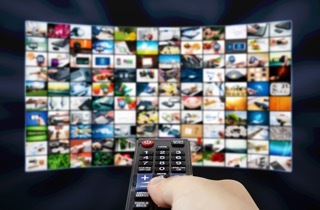 The transformation from cable to streaming content is a minor tweak to a mature technology. Nothing exciting is happening here. I have Netflix and Amazon. Grandkids like Netflix. I like free Amazon delivery. I cut the cord and receive free movies and TV shows with ROKU. I receive 47 channels with my RCA powered antenna mounted in a swinging outside door. Included are 13 PBS channels which can be better than networks, which often have nothing worthwhile to watch. Picture quality is much better than cable was. I pay $20.00 a month and will not pay more. I workout often at a gym and do not watch sports on TV. The future of TV in danger? Good. I no longer see any reason to watch broadcast tv, or for that matter cable tv. I suppose i would watch one or two movies a month and that makes me wonder how watching any more is possible if you want to have any semblance of personal, physical, social, cultural or intellectual life. I’m (sort of) retired and am just too busy to spend time on what seems to me to be relatively trite moving images with crass sound.